Percentage in world market India has approximately 5.6 billion barrels of proven oil reserves as of January 2010, the second-largest amount in the Asia-Pacific region after China. 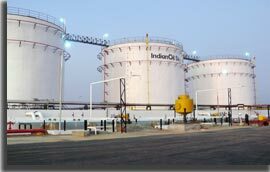 Indian Oil and Gas Industry have been successful in fuelling the rapid growth of the Indian economy. As India's largest company by sales, the highest ranked Indian company in the Fortune "Global 500" listing and the 18th largest petroleum company in the world, Indian Oil deals with a lot of information on an ongoing basis through its network of over 5,000 distributors of liquefied petroleum gas (LPG), has more than 2,000 gas stations or transactions from its 70 million customers all over India. The origin of Indian Oil & Gas Industry can be traced back to 1867 when oil was struck at Makum near Margherita in Assam. In 1947 at the time of Independence the Oil & Gas industry was controlled by international companies. India's domestic oil production was just 250,000 tonnes per annum and the entire production was from one state - Assam. The foundation of the Indian Oil & Gas Industry was laid by the 1954 Industrial Policy Resolution when the government announced that petroleum would be since then the core sector industry. In pursuance of the 1954 Industrial Policy Resolution, Government-owned National Oil Companies ONGC (Oil & Natural Gas Commission), IOC (Indian Oil Corporation), and OIL (Oil India Ltd.) were formed. In 1955, ONGC was formed as a Directorate and then in 1956 became a Commission. Indian Refineries Ltd, a government company was set up in 1958. 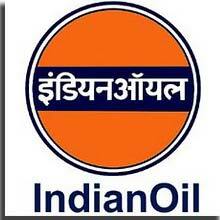 Later In 1959, for marketing of petroleum products, the government set up another company called Indian Refineries Ltd. Then in 1964, Indian Refineries Ltd was merged with Indian Oil Company Ltd. to form Indian Oil Corporation Ltd.
During 1960's, a number of oil and gas-bearing companies were discovered by ONGC in Gujarat and Assam. Discovery of oil in February 1974 of significant quantities in Bombay High opened up new avenues of oil exploration in offshore areas. During 1970's and till mid 1980's exploratory efforts were made by ONGC and OIL India to yield discoveries of oil and gas in a number of structures in Bassein, Tapti, Krishna-Godavari-Cauvery basins, Cachar (Assam), Nagaland, and Tripura. 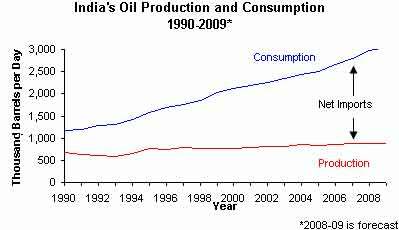 In the year 1984-85, India achieved a self-sufficiency level of 70% in petroleum products. Gas Authority of India Ltd. (GAIL) was set up in the year 1984 to look after transportation, processing and marketing of natural gas and natural gas liquids. GAIL has been successful in the laying 1700 km-long gas pipeline (HBJ pipeline) from Hazira in Gujarat to Jagdishpur in Uttar Pradesh, passing through Rajasthan and Madhya Pradesh. After Independence, India made significant efforts for its refining capacity. In the first decade immediately after independence, three coastal refineries were established by multinational oil companies operating in India at that time. This included refineries by Burma Shell, and Esso Stanvac at Mumbai, and by Caltex at Visakhapatnam. Indian government in order to increase exploration activity approved the New Exploration Licensing Policy (NELP) in March 1997 to ensure level playing field in the upstream sector between private and public sector companies in all fiscal, financial and contractual matters. The policy ensued that there was no mandatory state participation through ONGC/OIL nor there was any carried interest of the government. Today to meet its growing petroleum demand, India is investing heavily in oil fields abroad. India's state-owned oil firms have stakes in oil and gas fields in Russia, Sudan, Iraq, Libya, Egypt, Qatar, Ivory Coast, Australia, Vietnam and Myanmar. Indian Oil and Gas Industry has a vital role to play in India's energy security and if India has to sustain its high economic growth rate. After the Indian Independence Indian Oil Industry was a very small one in size and Oil was produced mainly from Assam and the total amount of Oil production was not more than 250,000 tonnes per year. Oil Industry in India during the year 2004-2005 fulfilled most of demand through importing oil from multiple oil producing countries. The Oil Industry in India itself produced nearly 35 million metric tons of Oil from the year 2001 to 2005. The import that is done by the Oil Industry in India comes mostly from the Middle East Asia. The Oil that is produced by the Oil Industry in India provides more than 35% of the energy that is primarily consumed by the people of India. This amount is expected to grow further with both economic and overall growth in terms of production as well as percentage. The demand for oil is predicted to go higher and higher with every passing decade and is expected to reach an amount of nearly 250 million metric ton by the year 2024. Most of India's crude oil reserves in India are located offshore, in the west and onshore in the northeast. Substantial reserves, however, are located offshore in the Bay of Bengal and in Rajasthan state. India's largest oil field is the offshore Mumbai High field, located north-west of Mumbai and operated by ONGC. Another effort is India's large oil fields are the Krishna-Godavari basin which is located in the Bay of Bengal. NELP framework is the primary mechanism through which the Indian government has promoted new E&P projects. The latest round of auctions, NELP VIII, was launched in April 2009 and attracted nearly $1.1 billion in investment. According to Oil & Gas Journal (OGJ), India has approximately 5.6 billion barrels of proven oil reserves as of January 2010, the second-largest amount in the Asia-Pacific region after China. India's crude oil reserves tend to be light and sweet, with specific gravity varying from 38° API in the offshore Mumbai High field to 32° API at other onshore basins. India produced roughly 880 thousand barrels per day (bbl/d) of total oil in 2009 from over 3,600 operating oil wells. Approximately their are 680 thousand bbl/d was crude oil; the remainder was other liquids and refinery gain. In 2009, India consumed nearly 3 million bbl/d, making it the fourth largest consumer of oil in the world. EIA expects and predicts approximately 100 thousand bbl/d annual consumption growth through 2011. In January 2010, Gas Authority of India Ltd (GAIL) said that gas availability in India is expected to grow at 23% compounded annual growth rate (CAGR) to 312 mscmd by 2013-14, buoyed by trebling of domestic production to 254 mscmd and doubling of regasified liquefied natural gas imports to 58 mscmd. India has total reserves of 775 million metric tonnes (MMT) of crude oil and 1074 billion cubic metres (BCM) of natural gas accordingly as on April 1, 2009, as per the basic statistics released by the Ministry of Petroleum and Natural Gas. Petroleum exports during 2008-09 were US$ 26.2 billion. In the eighth round of the NELP (NELP-VIII), 1.62 sq km area will be covered comprising 70 blocks. Out of 70 blocks, 36 blocks have been awarded under NELP-VIII, according to the Economic Survey 2009-10. Today, there are about total of 18 refineries in the country comprising 17 in the Public Sector, one in the private sector. There are 17 Public sector refineries are located at Guwahati, Barauni, Haldia, Mathura, Digboi, Koyali, Panipat, Vishakapatnam, Chennai, Nagapatinam, Kochi, Bongaigaon, Numaligarh, Mangalore, Tatipaka, and two refineries in Mumbai. 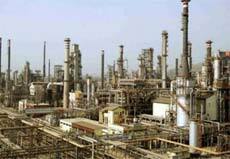 The private sector refinery built by Reliance Petroleum Ltd is in Jamnagar is the biggest oil refinery in Asia. Oil & gas industry jobs onshore or offshore, are most preferred career option for people due to its vast employment potential as well as high rate of wages. The oil & gas industry job vacancies exist in fields as well as rigs. Onshore and offshore jobs are mostly available for Petroleum engineers, Geoscientists, Pipeline engineers, Reservoir engineers, Design engineers, Shipping officers, Geologists, Drilling supervisors, Pipe stress engineers, Reservoir managers and many more categories. The general categories those can find employment vacancies in the oil and gas industry are mainly finance, sales, health, safety, refinery professionals and environment engineers. In the classification of Pollution, the Indian Oil and Gas Industry comes under the category "Red" which represents highly polluting industries. To support India's energy security the country is constructing a strategic petroleum reserve (SPR). The first storage facility at Visakhapatnam will hold approximately 9.8 million bbls of crude (1.33 million tons) and is scheduled for completion by the end of 2011. Then the second facility at Mangalore would have a capacity of nearly 11 million bbls (1.5 million tons) and is scheduled for completion by the end of 2012. The third facility of Padur is also scheduled to be completed by the end of 2012, which will have capacity of nearly 18.3 million bbls (2.5 million tons). The selection of coastal storage facilities are accordingly so that the reserves could be easily transported to refineries during a supply disruption. The SPR project is managed by the Indian Strategic Petroleum Reserves Limited (ISPRL), which is part of Oil Industry Development Board (OIDB), a state-controlled organization. India does not have any strategic crude oil stocks at this time. According to a report released by McKinsey a global consultancy firm at the VI Asia Gas Partnership Summit, India's natural gas demand is expected to nearly double to 320 million metric standard cubic metres per day (mmscmd) by 2015. According to the analysis the current demand of 166 mmscmd-made up of nearly 132 mmscmd supplies from domestic fields and the rest from imported liquefied natural gas (LNG)-is likely to rise to at least a minimum of 230 mmscmd and a maximum of 320 mmscmd by 2015. The government is planning for its first ever offer of shale gas exploration in 2012. Shale gas (gas locked in sedimentary rocks) is an emerging area. It has become an important source of energy in a few countries that have been able to commercially exploit this resource.